Monday night was the 6th and final draw of the President vs Vice Presidents Trophy at the Amherst Curling Club. Paul Hawkes’ team defeated the Lester Wah team, skipped by Dwayne Ogilvie, 7 – 5 with a last end steal. Peter Rushton’s team defeated the Ray Fowler’s foursome 8 – 6 also by stealing 3 in the final end. The Team of Paul Hawkes, Brian Faught, John Greer and Paul Coulter win the President vs Vice Presidents Trophy for the 2016 season. 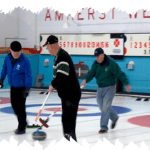 Drop in watch some Curling, 7:00 PM at 45 Prince Arthur St.